Helena Rubinstein photographed by Cecil Beaton, New York, 1951. Paris, Archives Helena Rubinstein - L'Oréal. PARIS – Her life is a true epic. She left her Jewish family in Krakow to try her luck in Australia, where she perfected a cram against wrinkles, which was a great hit in Melbourne. Helena Rubinstein then went on to conquer the world and opened her beauty institutes and laboratories in Paris, London, and New York. While her rivalry with Elizabeth Arden and her obsession with youth made her fame, the latter should also rest on her talents as a collector, as this exhibition reminds us. As of 1908-1909, at the same time as Vlaminck, Derain and Apollinaire, she was among the first to buy African art. Later, she would fill her apartments, as well as her hair salons, both on Faubourg Saint-Honoré in Paris and on Vth Avenue in Manhattan, with contemporary works of art. She accompanied all the avant-garde artists, from Elie Nadelman to Martin Barré, including Chana Orloff, Brancusi, and Soutine. While being one of the most represented persons in her time, photographers such as Cecil Beaton, stars like Dali, Portinari, Dufy, Marie Laurencin or even Graham Sutherland all rushed to do her portrait. 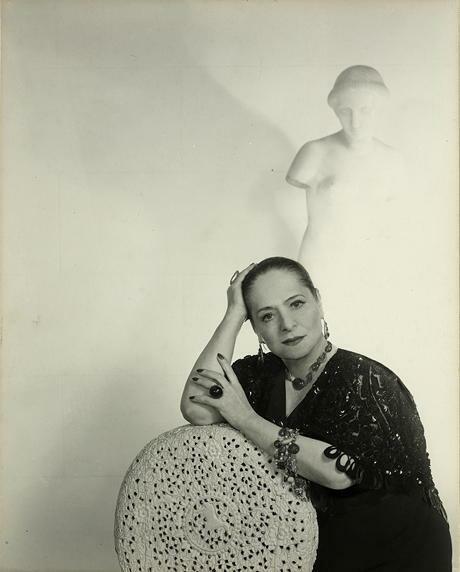 • Helena Rubinstein. L’aventure de la beauté at the musée d’Art et d’Histoire du judaïsme, from 20 march to 25 august 2019. Joaquín Sorolla, Strolling along the Seashore, 1909, oil on canvas, 205 × 200 cm, © Fundación Museo Sorolla, Madrid. LONDON – In 1908, a Spanish artist took care of hanging his own paintings for his exhibition at the Grafton Galleries in London. Each of his whims was an order. After all, was he not “the greatest painter in the world”? That was a century ago, and aside from his home-workshop in Madrid being on the “not to be missed” list of all visitors, the renown of Joaquin Sorolla (1863-1923) has greatly dwindled. The public at large has forgotten his name, in spite of various efforts made to show off his talent (recently at the museum of the Impressionism at Giverny). The National Gallery is doing its part with some sixty works from his different periods. His views of beaches and the coast – for which this native from Valencia had a natural empathy – hang side by side with portraits of the family he adored, in particular his wife Clotilde, as well as social compositions showing the hard life of fishermen, represented by a painting on loan from Orsay. This last dimension is often forgotten in the various eulogies of the “Spanish master of light”, a cousin of the Impressionists. • Sorolla, Spanish Master of Light at the National Gallery, from 18 March to 7 July 2019. Pieter II Brueghel, Outdoor wedding banquet.Oil on wood, 40x65 cm. Maastricht, Bonnefantenmuseum. Photo Peter Cox. Loan of The Cultural Agency of the Netherlands. CASSEL – In order to attract visitors to a tiny town with some 2000 residents, you need to set up a beautiful exhibition. The museum of Flanders was renovated in 2010 and succeeds to attract 20 times the population of Cassel each year. For this exhibition in particular, it has increased its efforts by investing all the town’s 1000 m2, with a vision of Europe having fun. There is no doubt that back in Brueghel’s day, people really knew how to be earthy! With loans from ten foreign countries – including England, Hungary, Denmark and Portugal -, we can admire village fairs, weddings, carnival combats, egg dances, bonfires to celebrate Saint Martin, Maypoles and romantic scenes. Pieter the Elder is not present as his works are very rare, and was recently shown at the Kunsthistoriches Museum in Vienna for an unforgettable retrospective, but his sons Pieter II and Jan I take the lead with brio, followed by David Teniers, Adrian Brouwer, Hans Bol. The exhibition hands us a mirror and asks us why do we no longer know how to have? Or, why are we no longer interested in representing them? • Fêtes et kermesses au temps des Brueghel at the musée de Flandre, from 16 March to 14 July 2019. BERNE – The Zentrum Paul Klee, with nearly 40% of the artist’s works, is so wealthy that it is practically self-sufficient. Except in this specific case where it aims at confronting the artist with his pairs. Wit loans from the collections of the Kunstmuseum Bern, the museum traces the network of the relations that brought Klee close to Picasso, Kandinsky or the Delaunays. The interest of this exercise is to bring forward personalities that are not studied as often, such as Marianne Werefkin, Jawlensky’s companion, or, even more so, Louis Moilliet, one of Klee’s oldest friends, who, together with Franz Marc, accompanied him on the famous trip to Tunisia in 1914. • Kandinsky, Arp, Picasso… Klee and Friends at the Zentrum Paul Klee, from 19 March to 1 September 2019. There are other means than partying to be happy. Some choose to travel, but others prefer being home. As the poet du Bellay wrote, our home is our province, and so much more. He would have liked this book. Fie hundred years after his demise, he could still find in it traces form his time in the castle sin the middle of wine countries, manors and country homes with stone staircases and tiled roofs, overlooking gardens with ponds, orchards and pigeon lofts that have resisted the outrages of time, like the Town Hall of Vieux Raisin in Toulouse. But he would also have been pleasantly surprised by the generations who followed him and who knew how to renew the art of the adobe. This book invites us to long walk, from Abbadia to Yvoire, going through Belcastel, Donjeux, Lignières or La Palice. It is richly illustrated (keep your glasses as the detailed notices are rather small), scanning through typologies (dining rooms, book cases as well as iceboxes, ovens, plants and gazebos) and materials (slate, volcanic rock, varnished tile and offers a trip through France that is more amusing than the Tour of France by two children written by G. Bruno. Though the index is complete, we regret the maps do not synthesize all the sites presented, a true array of the French art of living. • La demeure en France. L’art de vivre heureux, collective work, published by l’Esplanade, 2019, 384 p., €39.